…is a one time training and equipping event PLUS five months of personalized coaching designed for local church student ministry leaders and children’s ministry leaders. Jen DeJong began working in youth ministry in 2002 as the Youth Program Coordinator at First Presbyterian Church in Nashville, TN. She currently serves on the Ministry Architects executive team, overseeing the work with many of our churches. Jen graduated from Vanderbilt University with a B.S. in Cognitive Studies and a minor in Communications. She also earned a M.S. at Vanderbilt in Developmental Psychology with a special emphasis on parental involvement in teenagers’ extracurricular activities. She currently resides in Springfield, Illinois with her husband, Marc, and their two daughters, Maria and Rose. Tim Price began serving in student ministry and worship ministry during his college years. 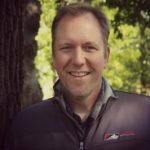 After graduating from Asbury Seminary in Wilmore, KY, Tim founded Harvest Ministry Teams as a way to equip young adults for Christian leadership. Over the last twenty years, Harvest has grown to encompass the summer ministry teams, Harvest Worship Band and Harvest Conferences. Tim resides in Troy, IL where he also serves on part-time staff in his home church. The good news is that more and more young people in our churches are now led by adults equipped with programmatic expertise, magnetic charisma, and a growing level of theological sophistication. The dangerous news is that far too many next generation ministry workers lack the self-awareness to recognize their blind spots and identify their favorite “games.” Even less of us know how to live with emotionally healthy rhythms or relationships. This session offers participants the opportunity to re-frame and reconsider their own practice of ministry, beginning first with the faithful stewardship of self or considering the person of ministry leadership before the craft of ministry leadership. The rise and fall of every church student ministry and children’s ministry hinges on the leadership team in the field. This session integrates the sometimes isolated tasks of recruiting leaders, and galvanizing parental and congregational support. Participants learn “hernia-free” principles for stewarding the gifts, tending the souls, and choreographing the wide variety of leaders in their ministries leaving them with “more than enough” volunteers. We have found that a large percentage of church staff student ministry leaders and children’s ministry leaders have never had an outside coach in ministry. Through coaching, we get an authentic and candid perspective on our ministries and more importantly, on the effectiveness of our own leadership. Coaching can help bring about change in our lives and in the church. Five months of coaching calls are included in the registration for this year’s Well Events. (This includes three community coaching calls and two individual one on one coaching calls, each one month following the sessions). The community coaching calls will be related to the topics from The Well and the individual one on one calls will be centered around your specific ministry, leadership and your church context. 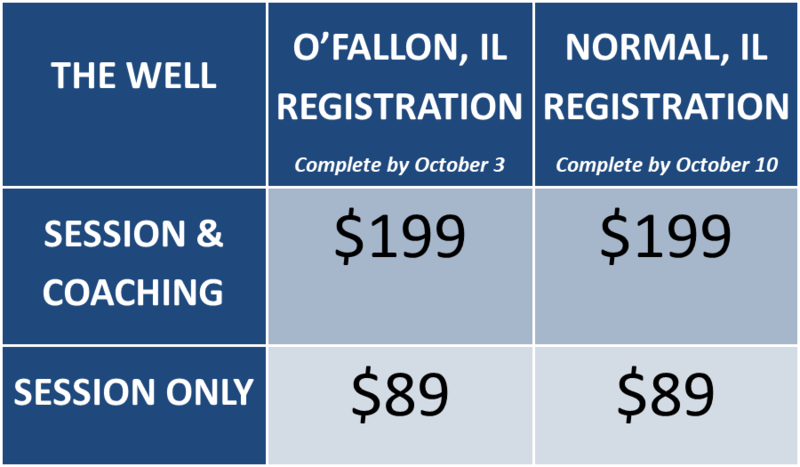 To register for The Well with a credit card on the phone, please contact 618-541-8291. Part-time, full-time, volunteer Student Ministry Workers, Youth Pastors, and Children’s Ministry Leaders. SPECIAL NOTE FOR PASTORS and CHURCH LEADERS: If your student ministry or children’s ministry staff person has not experienced outside coaching (or had it in a while), talk with them about registering for this event and offer to cover the cost through the church! 1) Create a get-away from the normal routine – We can easily become dull in the mundane routine. 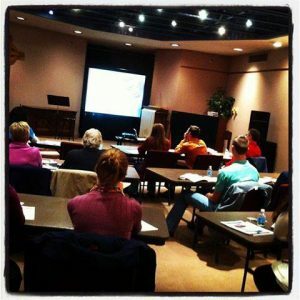 An equipping event helps sharpen us. 2) Connect with like minded people – Being around people who are in your boat is encouraging. The conversations are good and it’s great to see others who are involved in similar ways. Networking is powerful. When you attend a conference with someone from your church or organization, it will really spur on conversation between you and other leaders with whom you work. 3) Collect new thoughts and ideas from the presenters – A great conference will spur you on with new ideas, thoughts and concepts. Always be expectant to pick some great stuff. Soak up all you can and make notes. Seek to apply as much as you are able. 4) Compare current systems and work style to what might be more effective – There is probably always a better way to do what you are doing. And sometimes, it just takes a moment of experiencing it a little differently. Be on the look out to increase the effectiveness in your own organization. 5) Compile notes on hosting a conference or training event – I spend many weekends hosting training and equipping events, so attending another person’s conference allows for me to get new ideas. I always make notes in the margins about how they present, how their team works together, how they extend hospitality, and other creative ideas. “I came thinking I might be losing touch, maybe getting too old for this kind of ministry. I left knowing that as long as I can share my love for Christ and students, I will always be a part of next generation ministry.” – Annon. Can I afford The Well? The cost of the well includes the session, the meal together and the five sessions of personalized follow up coaching. After surveying nearly 100 ministry leaders, we worked to create a plan to be both effective and budget friendly. Most churches have money available to help equip the staff (paid or volunteer) and you’re invited to share the need for training with them. 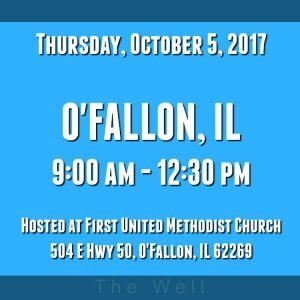 How will attending The Well impact my local church ministry? Attending a ministry equipping event always spurs on new thoughts, ideas and connections. It’s vitally important to continue to grow, learn and be refreshed in ministry leadership. The following coaching, a new component this year, is offered five times after the initial event. Two of the calls will be group coaching calls and the dates will be set in advance (and the calls will be recorded so you can access them). The other three calls will be thirty minute one to one phone conversations and will be arranged between you and the coach. Topics for the group coaching calls will be follow up to the two topics discussed during The Well event. The topics for the other three calls will be fluid, depending on your needs and your ministry context. What happens during The Well? The Well is about three hours in length then lunch. Upon arrival, we will welcome you, offer some coffee and then jump in right on time. Tim Price will lead two or three songs of worship, we will pray together, then turn it over to the presenter (Jen DeJong) for the two sessions. There will be a break and a time to network with other ministry leaders as well. Following the session, we will have lunch together (provided by the host church and included in the registration fee) and you are welcome to stay around as long as you would like to visit. The Well officially concludes with lunch. A resource table will also be available during The Well. Should I try to bring another person from my church with me to The Well? You are welcome to bring team members from your local church with you. We have designed a registration rate that includes the session and lunch only for additional team members who can join you. It’s always good to have someone travel with you and discuss ideas learned at the event. If you have more than three attending from the same church, contact us for a special registration rate. Is The Well affiliated with any one denomination? Over 20 different denominations have been represented at The Well over the years. For 2017, The Well will be hosted in a United Methodist Church and a Presbyterian Church. In the past, The Well has been hosted in many different churches, including American Baptist, Free Methodist, Christian, Vineyard, Lutheran, Non-Denom, Southern Baptist, Free Will Baptist and others. Any Christian who works with the next generation in the name of Jesus is invited to attend! Our believe statements can be summed up with the Apostles Creed, the Great Commission and the Great Commandment. I’m grateful for the opportunities we’ve had, through Harvest Ministry, to work with and serve thousands of children, students and ministry leaders since 1996. My calling in ministry is to help support local church ministry. The Well began in 2005, and every fall since, we have met around tables with ministry leaders for the purpose of equipping and encouraging. This year, we are taking The Well up a notch with personalized coaching to follow up the three hour meeting. It was through personal ministry coaching a couple years back that I was able to take a step in disciplined leadership in my ministry areas. As an example, during that particular season of coaching, I was challenged to read and it’s become a daily habit! I typically read 5-7 books a month and it’s been the basis of work I do in my church and on the ministry. I heartily recommend a season of outside coaching for any local church pastor or ministry leader. It will increase your intentionality and your effectiveness. 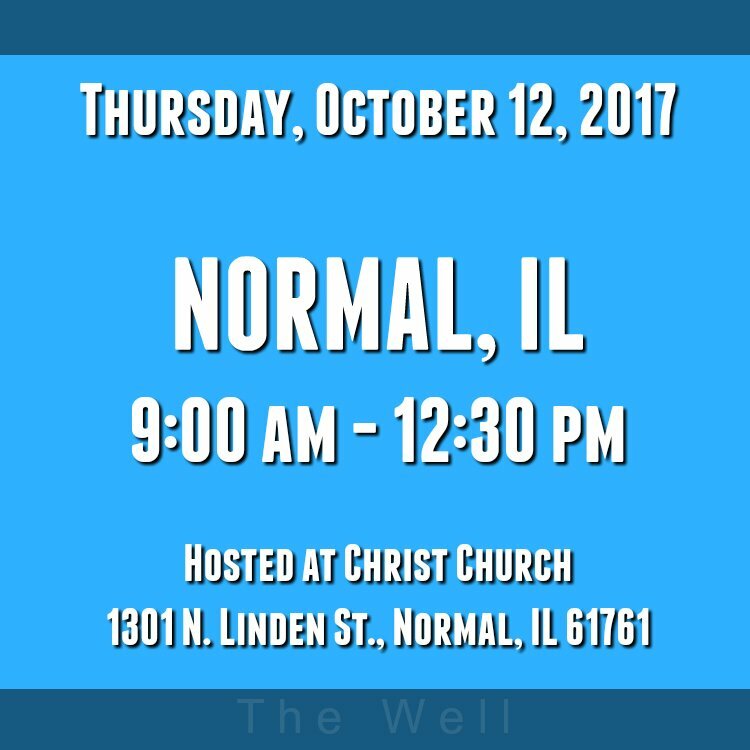 If you are a youth worker or children’s ministry leader in your church, I hope you will make plans to attend The Well in October! It’s close to home and it would be great to get connected with you. If you have any questions, let me know.